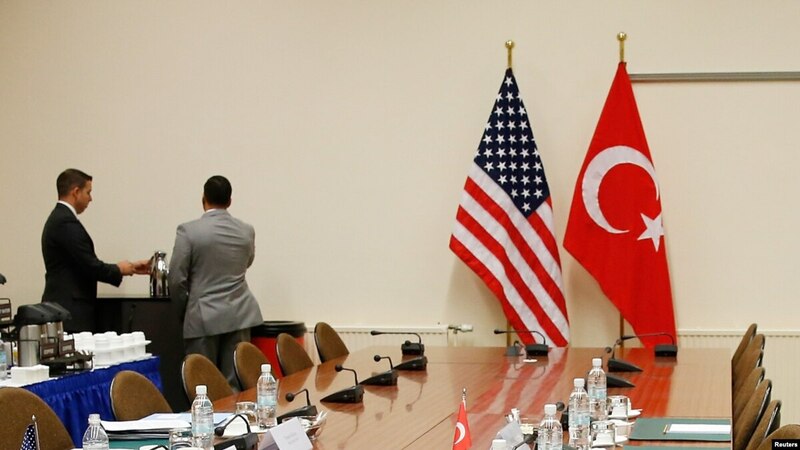 Political tensions between the United States and Turkey are increasing ahead of key meetings in Washington between the two governments, Voice of America's Dorian Jones said in an analysis. Turkish and U.S. officials are scheduled to meet on Thursday as part of a series of talks to address differences between the countries. Turkish Foreign Minister Mevlut Cavusoglu has warned the outcome of the talks would determine the future of bilateral relations. The meetings on Thursday are expected to focus on one main point of dispute, which is U.S. support for Kurdish militia in its fight against Islamic State (ISIS). Turkey says the People’s Protection unit (YPG) fighters are terrorists because they are linked to the outlawed Kurdistan Workers’ Party (PKK). Washington is concerned that the Turkish incursion into Syria’s Afrin, which began on Jan. 20, will distract from the fight against ISIS as Kurds leave their positions to defend the enclave. Those fears seemed well-founded this week, Voice of America said, with Washington confirming ground operations against ISIS had been temporarily suspended. An Arab militia that is part of the Syrian Defence Forces (SDF), the umbrella group of Kurds and Arabs under which the YPG fight, said on Tuesday it was sending 1,700 of its fighters to support Afrin’s Kurds. Turkey turned up pressure on the U.S. Department of Defense this week, saying it expects the United States to step in and halt the military shift of the YPG militia, which moves under its control in the nearby enclave of Manbij.